Two years ago, a stellar cast of ecologists changed the way conservation scientists think about biodiversity. As we tumble headlong into the sixth great extinction, biologists have focused largely on protecting regions with the highest number of species. By saving the most species, the thinking goes, you’ll conserve the greatest number of ecological interactions and so the greatest biodiversity. But in a study that drew on ecological theory and contemporary studies of apex predators like wolves and pumas, the all-star team of ecologists found that some species matter more than others. Losing top predators, they argued, can have far-reaching, irreversible effects on the structure, function and biodiversity of ecosystems. Ecological theory predicts that changes in the abundance and distribution of top predators can cause substantial shifts in ecosystems. And recent studies—many published in the new millennium—have shown how theoretical predictions play out on the landscape. The collapse of sea otter populations on Amchitka Island in the Aleutian Islands decimated kelp forests by allowing unfettered expansion of sea urchins, the otters’ main food. The loss of wolves in Yellowstone’s Lamar River Valley famously allowed elk to forage with abandon, arresting the development of streamside willows and other riparian vegetation. In Venezuela, forests without jaguars, pumas and eagles had almost no vegetative underbrush compared to the lush understory in forests where predators kept ungulate herbivores in check. But, according to the study, the loss of large top predators can also lead to soaring rates of wildfires, infectious disease and carbon emissions, and degrade water quality and nutrient cycles. Since pumas make risk-benefit calculations just like the rest of us and typically avoid humans—their biggest cause of death, aside from roads—Wilmers wanted to know what factors govern their decisions. He and his team figured the cats would steer clear of neighborhoods, where they’d risk seeing their nemesis in various activities, more than roads, where traffic can be sporadic. And they predicted the cats would respond differently depending on their reproductive status. If running into humans meant losing a meal, that would prove less costly from an evolutionary perspective, than if it meant losing a chance to mate or raise young—since, as any evolutionary biologist will tell you, we exist primarily to reproduce. The team combined their GPS data with field visits to determine whether cats were simply going about their business—that is, feeding (based on the analysis of GPS data and confirmed by finding prey remains) or moving about the landscape (GPS readings not linked to kill or den sites)—or engaged in reproductive behavior—denning (indicated by a female staying within a spot and making repeated return visits) or communicating (indicated by “scrapes,” urine-soaked leaves and debris mounded with the hind feet, the puma version of “here’s my number”). As predicted, the cats’ response to developments varied with their reproductive status. The data collected on their 20 collared pumas (12 females and 8 males) showed that the animals give human developments a wider berth when engaged in reproductive behaviors. Given how frequently human run-ins result in death for pumas around the Bay Area, it’s not surprising that evolutionary pressures selected against placing the next generation at risk. Similarly, the cats seem to have learned that placing their calling card near trails leaves them vulnerable to destruction by hikers and bikers. Still, it appears that taking care of large cubs makes mom willing to take more risks. The team found that females with dependent young showed higher tolerance for residential developments than males, possibly because they can’t afford to be choosy about where they find prey. Still, one male in the study did go near developments—a young male seeking new territory—an extremely risky behavior that the sexually immature male shot in Berkeley’s Gourmet Ghetto learned too late. There’s no doubt that our behavior influences the big cats’ behavior. If you live on the edge of puma habitat and plant lush gardens, you’ll attract deer—and likely their ancient predator. If you don’t safeguard your goats and sheep in enclosed pens at night, you’re just asking for trouble. An astonishing eight of the 11 adult pumas the team studied were shot for attacking livestock. 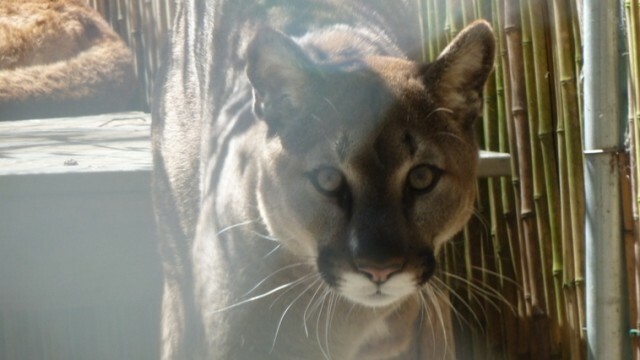 By understanding where, when and how pumas use their increasingly fragmented habitat, Wilmers and his team can predict how they might respond as development continues. They can also predict, and hopefully mitigate, likely conflicts between humans and the increasingly boxed-in carnivores. But ecologists, even the best ecologists, can do only so much. They need the rest of us to decide whether we’re ready to reverse the trophic downgrading of the planet before it’s too late.